On orders shipped to addresses within Unites States. On most items. Some restrictions may apply. See site for details. Release your inner rock star. Guitar Center provides musical instruments and supplies for guitars, amps, live sound, recording, and keyboards. 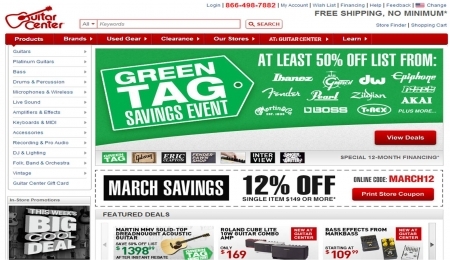 Browse their online catalog and know you will save big when using Guitar Center coupon codes. Then practice, practice, practice. This place might as well be named “A Musician’s Paradise on Earth.” Shopping there will make you feel like a kid walking into a toy store that doubles as candy store, and triples as a cupcake factory. You get the idea. The place quite literally, rocks. Guitar Center is the largest musical instrument retailer in the world, selling more instruments and accessories through their website and retail stores than anyone in history. If it makes music, or helps makes music in any way, they have it. Besides offering Guitars, Amps, Basses, Drums, and Keyboards, they are the leading provider of Pro Audio, Recording, DJ, Lighting, and Live Sound equipment for the stage and the studio. They carry all the major, legendary brands such as Gibson, Marshall, Fender, Pearl, Ludwig, Martin, Roland, and many more at the lowest prices you’ll find anywhere. In fact, you are actually guaranteed the lowest price from Guitar Center. Check their site for the details, but basically, if you find something you bought there advertised for less somewhere else, bring in the ad and they'll refund you 100% of the difference, plus another 10% of that difference. They also have their own fair and easy financing options to set you up with what you need while not breaking your bank. Want to see someone’s eyes light up with glee? Get them a Guitar Center gift card for any occasion. Doesn’t matter what the occasion is, they’ll love it. Their website features a great “Gift Idea” section for musicians, from beginner to pro, kid to adult. You can even sell your old gear, or use it to trade in and up. Just enter your info on their site and someone will get back to you with a quote. While you’re on their site, go ahead and take advantage of their online “Create a Wish List” so that your friends and family can see what you’re dreaming of owning someday. Maybe they’ll get it for you. You never know and you can always hope. Come on, you’ve always wanted a Les Paul and now you’ve worked long and hard enough that you can afford one. Treat yourself. Or grab a ukulele. They’re fun and easy to learn to play. Music is the spice of life, so spice things up for you or someone else, crank that Guitar Center coupon code up to eleven, and save some cash on the way to making some sweet, sweet sounds. Guitar Center is one of the largest chains of musical instrument stores in the United States. They are a dream for any string or wind instrument player, DJ, sound-guy, recording-guy, etc. Buy all or your Guitar Center instruments and supplies for less by using a Guitar Center coupon code. Below are instructions on how to use and apply your Guitar Center coupon code. 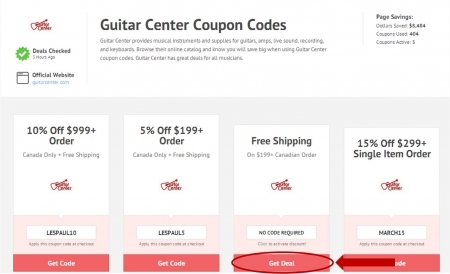 After locating the coupon or deal you want to use to purchase Guitar Center items, click the corresponding "Get Deal" or "Get Code" button on the Couponpal Website. A new window will pop open when you click on your button. If Couponpal is providing you with a Guitar Center coupon code, copy and paste from the pop up window. Keep this window open in case you need to come back to it later. If there is no Guitar Center coupon code, you will skip this step. You can now browse through the category of Guitar Center items you want to purchase. For example, you can click on Guitars, Platinum Guitars, Bass, Drums & Percussion, Microphones & Wireless, Live Sound, Amplifiers & Effects, Keyboards & MIDI, Accessories, Recording & Pro Audio, DJ & Lighting, Folk, Band & Orchestra, Vintage, Brands, Used Gear, or Clearance. Continue to refine your product search results by using the menu on the left side of the screen. When you find a Guitar Center item you are interested in, click on its picture to take you to the product page. 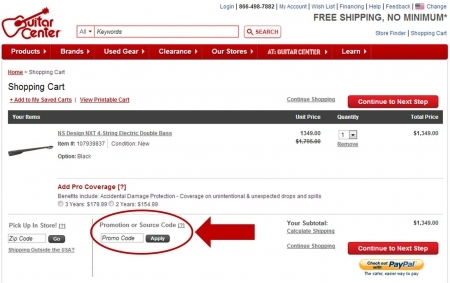 From the product page, select options such as color and any Pro Coverage you want, then click "Add to Cart." Confirm all the Guitar Center items in your shopping cart are correct. Enter your Guitar Center coupon code into the Promotion or Source Code box, then click "Apply." To continue with the purchase, click "Continue to Next Step." Fill in shipping information, billing information, and payment information. Whether you rock the bass or the acoustic, Guitar Center has the ultimate selection of instruments. You can find anything a musician desires at affordable prices. Plus, with a Guitar Center coupon code, you’ll save tons of money--music to anyone’s ears! Why isn’t my Guitar Center coupon code working? If your Guitar Center coupon code doesn’t appear to be working, check to make sure there aren’t any special restrictions attached to the deal. 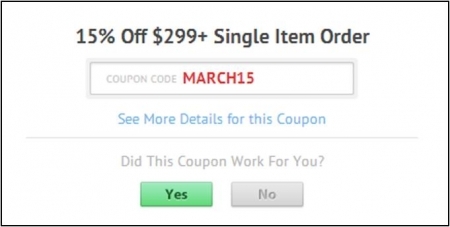 Sometimes things like expiration dates or minimum size orders can prevent a coupon code from going through. To contact Guitar Center, you can call 1-866-498-7882, seven days a week from 5 a.m. to 11 p.m. (PST). To send them an email, fill out the form at Contact Us. Guitar Center wants you to be 100 percent happy with your purchase. If you’re not, you can return the item within 30 days of purchase for a full refund. However, returned items must be in original condition with no sign of wear or use. Also, the refund does not cover shipping and handling charges. There are some exceptions to the return policy, because select items (like recording devices or DJ equipment) must be returned within 14 days. Returns are not accepted on clearance items, books, CDs, etc. For more details, visit the Returns page. You currently do not have to pay for shipping at Guitar Center! The offer does require that you spend a minimum of $49, but only when you’re having it shipped to your address. If you’re willing to pick the item up at your closest Guitar Center retail location, shipping is completely free. This promotion will help you feel less guilty about spending dough on other items! Guitar Center currently accepts Visa, MasterCard, Discover, American Express, or Guitar Center’s Preferred Player Card. They will also take PayPal and Bill Me Later (which is a payment method where you can pay for your purchase in installments.) If you’d like to pay by Western Union Quick Collect or Bank Wire Transfer, you must phone in your order. What is the Guitar Center Price Guarantee? They are so sure they have the lowest prices around, they’re willing to guarantee it! If you find that an item you’ve purchased is available at another retailer at a lower price, Guitar Center will pay you the difference. The restrictions are that it must be within 30 days, you have to bring in your original receipt, and you must have proof of the other retailer’s listed price. For more information, visit the Guarantees page. Guitar Center knows it’s easier to rock out when you know you got a great deal on your instruments. They have many ways to save when you shop on their site, so you’ll be able to dedicate more time to your music instead of looking for affordable prices at other places. Here are just a few of the many ways you can play your way to great savings. Shipping is free at Guitar Center if you spend more than $49. If you want to have your purchase shipped to your nearest Guitar Center location, you don’t have to pay anything for shipping! This discount will help you save a ton of cash on your order. The Clearance Section at Guitar Center has discounted merchandise available for unbelievable prices. You can find everything from bass guitars and drums to keyboards and guitar cases. There is also free shipping on many of the items. Don’t forget to check this section for all the closeout deals! Flash Deals are insanely popular at Guitar Center. Every week they pick the best deals--but they only have a limited amount and they’re only available for a limited time! You’ll understand what a great value these deals are when you see the super low prices on all the items. Make sure you check out the guitar, bass, and pro audio deals before they run out! Another way Guitar Center saves you money is by offering mail-in Rebates on many of their items. These rebates include free giveaways, discounts, and cash or gift-card rewards. Most customers forget to check the rebates section, so they’re often available to the customers smart enough to look for the extra promotions. By signing up for the Guitar Center Email Newsletters, you can ensure you never miss out on any special sales or deals again. All you have to do is provide your email address, and Guitar Center will alert you to flash deals and other exclusives. You can also get notifications for artist competitions and gear news and reviews. Guitar Center makes it easy for you to save on all your purchases. With your Guitar Center coupon code, you’ll earn savings that will be music to your ears!